Of course, the Navy fleet guys just got through asking for a delay in the delivery of the sorely needed LPDs, in order to pay for all their new fangled fleet gear. Please pardon the Marines for thinking (correctly) that the bluewater Navy is not especially focused much on the needs of the gator navy. But, yeah, from a blue water naval perspective, that all makes for a great argument. But for the Marines, it makes for a very bad and unwelcome argument. Losing command and control of the gator navy is of course a net loss of control and prestige and capability for the Marines. So obviously it is a bad deal for the Marines, and for their ability to complete their mission of littoral warfare, But this is not just about losing turf battles. 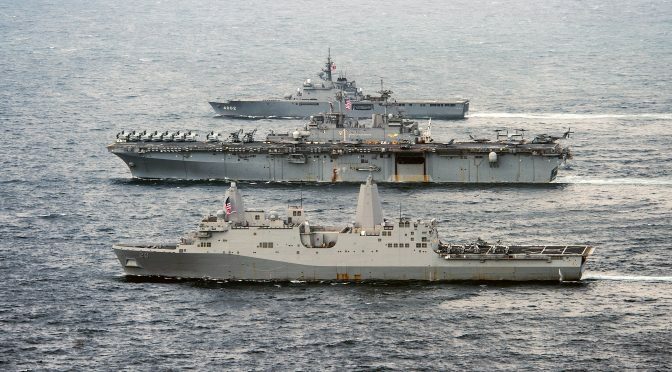 For on the other hand, if the Navy succeeds in taking control of the amphibs, and turns them from their primary role to support the ARG and the MAGTF, and loads them up with offensive weapons for fleet support, then that will make the amphibs much MORE expensive than they already are, while diverting the amphibs from their primary mission of littoral ground warfare support..
As we read in another post here recently on CIMSEC, it is the fact that we already load up our amphibs with lots of weaponry and sensors, and the crews to run all that gear, today that makes them a lot more expensive than necessary to serve their primary role as seagoing buses for the Marines … and therefore makes them unaffordable in the numbers actually needed. Adding even more weapons and sensors to these ships, to enable them to perform a mission that actually conflicts with the overall mission of the gator navy, will certainly result in even FEWER amphibs than the insufficient number we have today. Plus, the more lethal we make the amphibs for fleet support roles, the greater will their target value as surface combatants, as perceived by our adversaries. I much prefer going the opposite route, i.e., as the other author on CIMSEC recommended, to simplify the amphibs, make them far cheaper to buy and far cheaper to operate, and therefore obtain enough of them to actually meet the needs of the ARG and MAGTF. Then let the Navy be the Navy, and let the Marines be the Marines. And let there be no sneaky back door takeover attempts sugared up to sound like the Marines will end up with more, when instead the Marines will end up with fewer more expensive amphibs … and to add insult to injury, render the Marines subservient to naval fleet commanders. It’s otherwise called a “lose-lose proposition” for the Marines, but a win-win proposition for the blue water Navy. The author does not understand how CATF/CLF firs in to JFMCC and the higher level C2 of the CTF and greater theater strategic commander. The author mixed apples and oranges throughout his so-called article. CATF/CLF, JFMCC, Forces are incorrectly used throughout…. until the “Navy” concept developers creat a cogent national strategy developed under the direct guidance of DOD (NSC) – spell that raison d’etre…. articles like this will continue to make our senior leadership scratch their heads re., about how our nation will use this current asset and/or build “the future force.” Just hogwash. Further, words which sound “cool;” such a, aggregate, disaggregate, blended (?) just confuse the reader. Plain,clear, and concise language should be the norm.